Emu farming is going to be the most profitable business in the near future. Farmers in Punjab have taken to emu farming to exploit the multiple returns offered by these birds, in terms of their meat, oil, skin, feathers and even their colourful eggs are in huge demand for ornamental purposes. In Punjab state Gunraj Singh, whose love for the bird prompted him to set up state first emu farm feels that emu farm in state will turn out to be profitable venture, and will hugely contribute to the state’s economy. The business such as poultry, dairy, ship or goat raring or animal husbandry often suffer due various factors such as eruption and spread of infectious and contagious diseases, resulting in sudden fall in production, climatic charges, excessive heat and scarcity of water. Emu is naturally immune to all these adversities; hence, farmers prefer emu farming. 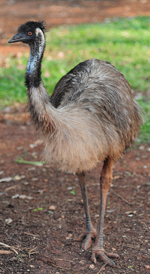 Originally, Emu is a resident of Australia, a very sober bird, living on grains, cereals, pulses and grass, its immune system is so strong that it hardly suffers from any disease. It survives in any type of climate. Every part of emu’s body is commercially valuable. Hence, in Maharashtra too, emu- farming is taking its roots. The Government as per 1972 forest animal husbandry act for protection and eager of forest animals has permitted emu farming which offers great opportunity for foreign investments and export. Besides emu farming is not labour-intensive and it is compatible with rearing other livestock. In winter, female emu lay eggs after a gap of every three days. Using an incubator,eggs hatch in 49 to 52 days. Areas with water availability I abundance are appropriate to practice this unique farming. Considering the ever growing population in India we must think about the future requirement of proteins. Verily emu will be our food for future! The obvious reason for this is emu- flesh is pulpy and has 98% fatty portion with least cholesterol and high percentage of iron in it. The oil extracted from emu-fat has medicinal value. Emu skin is very soft it can take up any colour and hence can be decorated with a variety of colours. Emu skin can fetch handsome money in international market. So the importance of this business lies in the availability of rich proteins for our people and the export potential for the oil and the skin obtained from the bird.